The understanding of Dispensational Theology is important. Today there is an unstable approach studying scripture in Christendom which leads to error and many times causes confusion. I hope and pray that those who personally study doctrine, prophecy and theology discovers the stabilizing truth found from an accurate scriptural methodology integral in a dispensational approach found in scripture. The correct expounding of the truth with accuracy in teaching and writing are a great need in today’s world. The whole of Scripture is for humanity to live life correctly for our learning, there are numerous examples and eternal principles given for us throughout the Bible. Living correctly includes a correct Dispensational approach when studying Scripture, II Timothy 3:16, Romans 15:4, II Timothy 2:15, Ephesians 3:2-4, Romans 16:24-26, Colossians 1:24-26. 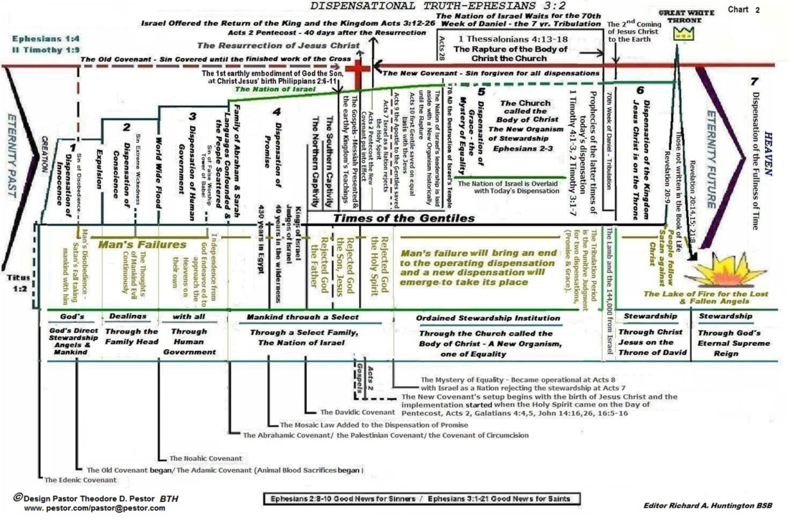 As you study this subject the Charts enclosed will help you comprehend the symmetry of God's Word, and prayerfully God will open your eyes, experiencing an excitement of God's Word you have never known! Finding, the answers you have looked for, and how to make sense out of Scripture. The study is written for laymen as well as professional Theologians and Pastors to provide spiritual growth and understanding, Ephesians 4:11-25, II Timothy 2:2, II Timothy 3:14-16, II Timothy 2:14-16. There is scriptural validation for a dispensational understanding in seeking what the inspiration of God the Holy Spirit has spoken through humans as recorded, Scripture did not come from human invention, II Peter 1:19-21. In the study on the dispensations, it is clearly seen, God has always provided the means for man’s salvation in each dispensation, revealing His working, and expressing the need for men to appropriate God's provision by receiving it by faith and obedience. Adam and Eve could eat of the Tree of Life freely which God provided, but they choose to eat of the Tree of Knowledge of Good and Evil. We read that after they sinned they covered their own nakedness with leaves, (That was their religious works.) which was not of blood therefore, non-sufficient to change their sinful circumstances; afterwards God covered them by a blood sacrifice which He alone provided (Substitutional.). They accepted His covering of animal skins (faith producing repentance.) where He shed the blood needed for a covering of sin. Adam and Eve put aside their own covering of leaves that they had made and accepted God's provision which was sufficient for a sin offering (Transformation), Genesis 3. Adam and Eve did not deserve His forgiveness, but God in His love provided the only means. This way of forgiveness was provided by God and He did this through the Lord Jesus Christ, I John 5:9 -14, Romans 10:9-13, Act 4:10-12, I Corinthians 15:1-4. Those who accept responsibility on a personal base for their sin because of their inherent sinful nature, receiving Jesus Christ by faith brought about by repentance, becomes a child of His redemption, Titus 3:5, Ephesians 2:5-9, Hebrews 11:6. Today without Jesus one cannot provide the means for forgiveness or receive forgiveness for themselves. Men and women perish due to their own refusal and by efforts created by their own choosing "man-made religious works", instead of God's way, John 3:16-21. Salvation is found in each dispensation and together the dispensations show the truth of how salvation was at work throughout the history of humanity (see chapter on salvation). Remember, God planned putting redemption into place before the foundation of the earth and this plan goes throughout the history of humanity, Ephesians 1:1-6, I Peter 1:20. Today if this has happened in your life and you have been transformed - you can live the abundant life. God desires you to find the security through this study, discovering Him in His word and in His creation. II Corinthians 5:17-21. God's perfect love should drive the lost and redeemed to want to know all there is about eternal salvation and His ways and works, II Corinthians 5:14. In God’s foreknowledge He has predestined (predetermined) us by calling and justifying us by the finished work of the Lord Jesus Christ, with our response to Him, glorifying us in our position now and forever, Romans 8:12, 29-30, John 17, I John 4. And as the redeemed we have a responsibility to live as one set apart from the world's ungodliness, yet not isolating ourselves from the world, but giving testimony in actions with words of godliness, sharing the truths of God, (Living sanctified and as His ambassadors. ), II Timothy 2:15, Hebrews 11:6, James 4:8, Romans 12:1,2, I Corinthians 5:9-11, II Corinthians 5:13-22. God blesses those who know Him. In getting to know Him personally, one needs to study the source of His revelation, His words are found in the Bible. Commissioned as a child of God we should know how to discover the truths found in the Scriptures and the history which goes beyond salvation, giving clarity in our deportment, in our studying, teaching and the preaching of God's works on His behalf, Hebrews 5:11- 6:1-2, II Timothy 3:16-17, Romans 15:4. That is why Dispensational Theology is important along with Practical Theology and the other studies of Systematic Theology. The word Theology is not a complex word, it means the study or teachings of God. The understanding of the dispensations for today’s believer is not an optional undertaking, but dispensational learning gives clarity to the understanding of the systematic framework of God since the beginning of time. Accuracy is very important in Biblical studies not only for word studies, but also for understanding the paramount view of God’s working throughout history as recorded in the Bible from the beginning of creation to the eternal end of all things. Every individual dispensation must be viewed along with the rest of the dispensations in discovering the whole splendor of God's plan found in the Bible. The result of a balanced and accurate dispensational approach to truth will give harmony and beauty revealed in Scripture! Stagnation, retardation, complacency, contentment without answers, rebelliousness should never be the end of ones owns knowledge of God! Contentment should never be a choice when it comes to knowing the word of God and discovering the truth found in the Scriptures. We need to examine God’s word when someone points us to a truth that we may have missed or have been misinformed to believe. It is a lack of good judgment for one to disagree with another’s view of Scripture or dismiss it without having a full understanding of the view. Remember that the Bible is God’s infallible word, inspired by the Holy Spirit. God in his transcendent nature and holiness has revealed the truth of His working to humanity, II Peter 1:19-21. The study of dispensations teach the revelation of God and His entering into the world, providing (ordaining) an orderly economy with leadership to bring about His glory (administrations), Ephesians 3. God is outside the material universe, He is not limited, but in love He enters the world's affairs holding all things together, and keeping record of the righteousness, justice and holiness of humanity, Romans 5:5-9, John 3:16, I John 5:9-14, John 1:1,14, Philippians 1:5-11. How awesome and beautiful is God's loving works for humanity. Therefore, in this study of dispensations seek an accurate, fair understanding of the truth when approaching the scriptures. Endeavor to acquire the knowledge, enabling you to understand a brother and sister in the Lord with respect to their scriptural position before considering them in error. Many today have not discovered the beauty and harmony that dispensational truths give to Biblical understanding. This is because of a ‘milk toast’ approach or a ‘pick and choose’ interpretation of Scripture that produces confusion, due to preconceived ideas. However, knowing the key principles of dispensations will help keep a solid foundation when studying the Word of God. Just as there are seven dispensations. There are seven guiding principles within each dispensation. Studying these guiding principles for each dispensation gives understanding to God's plan and working. The 'milk toast' approach to scripture will never get one beyond salvation, it has causes many people to do only a superficial study in the Word of God, missing the foundation of Biblical truth. The milk toast approach caters to feelings over facts and spiritualization that can be faulty. Practical Christian living and feelings are important, but they should never take the place exclusively to knowing God's word better. Believers are subjected to Satan and the cults if they are not rooted in their knowledge or mature in the Scripture, II Corinthians 4:3-5, I John 4:1, II Corinthians 11:13-15. The 'milk toast' approach leaves one vulnerable and open for immature, and wrong teachings of men and traditions, Hebrews 5:11-16, 6:1-3, Ephesians 4:14. Many believers have not followed good exegesis in their discovery of God’s dispensational (administrations) truths throughout history, causing confusion and errors as a result. The Covenant Theological points of view, seeks to unify the Bible on covenants only, or the Covenant of Redemption. Other focus on the Scripture as having only one dispensation instead of seeing the seven unique dispensations revealed in God's total program. Others mix a dispensational view with a covenant approach to God's working out His plan, where others have mixed their dispensational view with the Covenant Theology instead of keeping dispensations and the covenants as two distinct entities. Some who espouse dispensations have no consistent guiding principles or guidelines. The correct dispensational approach with guiding principles in the study of dispensations will show how to understand the distinctions, clearing-up the mistakes of interpretation. A dispensation is not a covenant, and a covenant is not a dispensation; but both have a place in understanding the total of God's working. There are guiding principles making a dispensation just as there are principles making a covenant. Other reasons for opposition are the threat to 'what they have always believed' (a flesh problem), and a sinful nature. At times it will be a direct attack by the enemy Satan, trying to keep one in confusion. Let us hope and pray as Paul did for the people of Ephesus that their eyes would be opened, Ephesians 1:15-16. The challenge is to study the scripture to see if these facts are present. One who studies God’s Word will find new strength and understanding to their personal life with a greater ability to apply Scripture. A dispensational approach is symmetrical giving the understanding of events of the past, present and future of God's total plan. However, knowing about dispensations does not save anyone from their sin or give eternal life, but it does gives a clear understanding of God's desire that “whosoever will could be saved.” Dispensations show how God brought redemption to earth for each period or economy of the history of the dispensation. And, how man was to express faith and obedience to the rules He ordained. Dispensations will show how humanity fails in the economy and God moves in His long-suffering from the failure to the next dispensation. A failed dispensation will have universal corporate sins, a transition and a punitive judgment brought about by humanity's failure. The Biblical definition of dispensation is the dispensing of the household rules of God, it is the economy operating. A dispensation's continuation is controlled by the success or failure of the economy. It is not governed by time, but God's long-suffering and the success of the economy. 1. NT: 3622 oikonomia (oy-kon-om-ee'-ah); from NT: 3623; administration (of a household or estate); specifically, a (religious) "economy" KJV - dispensation, stewardship. Luke 16:2,3,4; I Corinthians 9:17; Ephesians 1:10; 3:2,9; Colossians 1:25; I Timothy1:4. The Greek word found nine times in Scripture. 2. NT: 3623 oikonomos (oy-kon-om'-os); from NT: 3624 and the base of NT: 3551; a house-distributor (i.e. manager), or overseer, i.e. an employee in that capacity; by extension, a fiscal agent (treasurer); figuratively, a preacher (of the Gospel): KJV - chamberlain, governor, steward. Luke 12:42; ;16:1,3,8; Romans 16:23; I Corinthians 4:1,2; Galatians 4:2; Titus 1:7; I Peter 4:10, Used 10 times in the original Greek. 3. NT: 3624 oikos (oy'-kos); of uncertain affinity; a dwelling (more or less extensive, literal or figurative); by implication a family (more or less related, literal or figuratively): KJV - home, house (-hold), temple. There are 114 occurrences in the original Greek. 4. NT: 3551 nomos (nom'-os); from a primary nemo (to parcel out, especially food or grazing to animals); law (through the idea of prescriptive usage), genitive case (regulation), specifically (of Moses [including the volume]; also of the Gospel), or figuratively (a principle): KJV - law. There are 196 Occurrences in the original Greek. It is disturbing when the wrong word choice or the omission of a good Biblical word is used or denied. Dispensation should always been used for the proper Biblical meaning of the text. When a substitution by a translator was inserted, it violates the full meaning of the translation from the original language, (Examples: fellowship [KJV] or dispensation left out of text). This produces an incorrect or incomplete translation of the original language. We can see that 'dispensation' is a Biblical word which should have been translated by one of the following words: dispensation, administration, stewardship, manager of a household, or economy which would have an equivalent meaning of the Greek definition, translated into our English-language. Studying dispensations is not a movement, but truths for putting God's progressive working in the correct order through history. Dispensations clarify God’s dealings with humanity from the time He designed the plan to its implementation of how man was to execute it, (The word administration is a good word giving similarities of meaning of a dispensation). However, if history repeats itself there will be those who oppose a study of this type. They will misrepresent it with terms such as ‘Dispensationalism,’ or Ultra Dispensationalism' attempting to make it a human movement and something that is to be rejected. Why? It is hard to know the intent of every Christian, but most often it comes about because of the ignorance or a refusal to change from what one was taught in school or seminary. The understanding and approach takes spiritual growth and with a correct evaluation of dispensational truth, one will see it holds up to scriptural inspection and therefore is scriptural. It would be helpful to understanding that the Bible is not assembled by reflecting the dispensations, but by themes: Historical, Poetry, Major Prophets, Minor Prophets, Gospels, Acts [historical], Paul's Epistles, General Epistles and Revelation. If they were arranged by dispensations they would reveal the order of God's working through history. Also, some individual books like Acts for example, contain the teaching of two dispensations in transition, the Dispensation of Promise and the Dispensation of Grace, it records the transition ending of one dispensation, and the reveals the developing new dispensation in transition. Another example is the book of Genesis, it covers the life, the development and transitions of four dispensations, Dispensation of Innocence, Dispensation of Conscience, Dispensation of Human Government and the beginning of the transition into the Dispensation of Promise. The majority of the Bible is written about the Dispensation of Promise and the Nation of Israel. However, the majority books of the New Testament were written by the Apostle Paul (13 possibly 14) revealing the Dispensation of Grace, called the church, the body of Christ for today's dispensation. The book of revelation is written about the prophetic future covering the punitive judgment on the non-believes from the Dispensation of Grace and records the prophetic finishing punitive event of the Dispensation of Promises relating to Israel and God's wrath on the world. The book of Revelation covers the transition to the dispensation of the Kingdom on earth, and ends with the Eternal Kingdom, or the Dispensation of the Fullness of Time with the New Heaven and Earth in place. The Books of the Bible order by literature type. 5. Minor Prophets - Hosea, Joel, Amos, Obadiah, Jonah, Micah, Nahum, Habakkuk, Zephaniah, Haggai, Zechariah and Malachi, The reason they are called the minor is the size of the book. Minor can leave a false impression; they are as important as the Major Prophets! 3. Pauline Epistles - Romans, I Corinthians, II Corinthians, Galatians, Ephesians, Philippians, Colossians, I Corinthians, II Corinthians, I Timothy, II Timothy, Titus, Philemon, and possibly Hebrews, The Apostle Paul is the Apostle to the Gentiles, the one entrusted with the full revelation of the Mystery dispensation and he wrote the majority books of the New Testament. It would be helpful to consider the scriptures corresponding to the order of each dispensation when studying. The relationship to Systematic theology is important. In the study of Systematic Theology there should be a category included called Dispensational Theology, (Systematic Theology are the studies of God works and actions). A dispensational study of scripture should be a sub-category under the disciplines of systematic studies (Dispensation is the study of God's administrations and the steward throughout Scripture). The following categories in Systematic Theology in which dispensation should be included. It is hopeful that God will bless the study of the dispensations and the teaching, giving understanding one desires and renders enlightening, which gives security and hope for eternity! Knowing where a dispensational truth is found will help brothers and sisters in handling their problems by applying the scriptures taught correctly. Correct information is important in our witness to the non-believers. Dispensational teaching gives believers stability and guidance. It gives order and understanding to tough questions. It protects believers from falling into the same errors that others have fallen into. It keeps one from being deceived by false teaching or preaching spoken in error. Knowing dispensational truths give freedom to worship with other believers without falling into their same errors that they have embraced due to their lack of a dispensational approach to scripture. When understanding a dispensational truth, you will be able to identify the errors, keeping you from confusion, and preventing you from being tossed 'to and fro’ in your faith. Knowing dispensational truths of God’s Word will give clarity and understanding as to why other religions which claim to be Christian are wrong with their religious practices that accompany their man-made beliefs or Theology,(Ephesians 4:14,16). Dispensational truths show how God has worked in history since the world began providing redemption to all who will receive His Word. Dispensations give systematical and symmetry in understanding to the whole Bible, clearing up the confusion which has plagued the church since the first century. It puts in order the historical and progressive revelation of God’s dealings with man since the beginning of the world and it will show how future events all tie together in symmetry. Dispensations show the differences between historical events and changes occurring afterwards and why. Dispensations give the understanding of – whom and why the passage was written - the purpose for which it was written - and how it all ties together in the workings of God throughout history.